Tomorrow we head to the hospital for a week of being inpatient for Round 1 of Antibodies. There is a lot of anxiety that both dad and I are feeling and even Emily is feeling. Its the whole not knowing what is going to happen, what she is going to feel and how things will go. All we want is for her to be comfortable. We have a lot of anxiety about the extra line that she will need and how that will go. We will keep you guys updated during the week of how Emily is doing and handling things. Sue and Jojo arrived today, to be at our side and help with anything and everything that we need. Thank you guys so much for driving 6 hours to be of huge help. We got home yesterday from our long drive back from Michigan, and on the way home stopped at Buford Pharmacy to pick up the GM-CSF. Thank you (you know who you are) for helping to make sure that Emily could get her medication, thank you! Last night mommy went to give Emily her first shot with no nurses around and realized that the vials were not liquid, it was a white hard powder. After dad and I researching and learning that the leukine was lyophilised (which is like freeze dried) that we have to reconstitute (which means mixing the freeze dried leukine with sterile water) the leukine. So after contacting another pharmacy to figure out what to do, she said we needed to have a prescription for the sterile water. So by then it was already 930pm, so I called the on call number. The doctor on call tried to call some pharmacies close by but no one had anything, so at 1045PM, we were heading to the ER to have the nurses in the ER show me how to reconstitute the medicine and some to take home. It was one of the quickest visits, but one that we shouldn't have had to take. Mommy was able to get her shot together tonight and give it at home, with no problems. Emily is handling the shots really well and we are so proud of her. Tonight she didn't even cry, she only said ouch, we are so proud of her. Throughout this journey with Emily, it gets harder and harder with the treatment and what Emily has to go through. However, we continue to charge on and even Emily does to, even though she wishes this was done and over (we do too). We have noticed people who were once around and wanted to be around to help seem to have faded away or we don't hear from them, but we are still charging on! While to some what Emily has to go through may seem old, because come December this will be 2 years Emily has been fighting, but this is never old for us, we continue to deal with this and day to day this is just something different and new that we deal with and teach our daughter what is happening to her. While dad and I try so hard to be so strong, it gets hard to be so "strong" when your 5 year old daughter says to you, "Why did you put me in treatment?" Getting Emily into this compassionate trial, we realize that our options are just getting smaller and smaller. This too is hard to realize that her options for treatment are dwindling. While we are honestly thinking that the antibodies is the best thing for her, and it is something her body has never endured, we still have to think about what happens if this doesn't work. And if it doesn't work, what else is out there, knowing that her options are just getting smaller and smaller. We also want to thank all of the amazing people out there who continue to do amazing things and be of wonderful help. Emily loves for us to go to her mailbox and she has mail to open, I can't tell you guys how much it makes her smile. 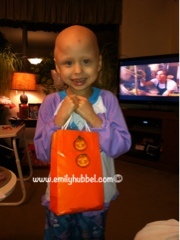 Thank you to Emily's little pen pa, Sydney,l for leaving a little halloween love with Sue for her to pick up. Thank you to Stephanie for the box of fun stuff for Emily and the cute hat. Thank you to Linda and your sweet letter and love that you sent. We can't wait to meet you when we are in Massachussetts again. (Ahh Massachussetts, we miss all of our family there so much!! We love you guys!) Thank you to everyone who has been such of wonderful help to us, THANK YOU! Well, I need to get some rest, hopefully dad and I will be able to sleep tonight. We had a great day with Sue and Jojo. Mommy made chili and cornbread for dinner tonight and we enjoyed hanging out with Sue and Jojo doing crafts and hanging out.Thank you guys! Tomorrow starts another journey with new therapy, and we are nervous with lots of anxiety, so please send your love and thoughts to Emily! Make sure you hug and kiss your kids and tell them how much you love them. We love you Emily, Jessie and Brianna! Night! I cannot begin to tell you the amount of courage you exude throughout this journey. Emily is such a beautiful, special girl and she obviously gets this from her parents. What you all have endured is huge. It is an honor to pray alongside you. I wish I could tell you this trial will be smooth with desireable results, but I have no answers. I do have the upmost respect fot giving everything you have got to advocate for your daughter. 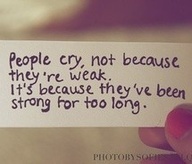 It is when we are weak that He is strong. Continue to rely on Jesus, He will get you through this one day at a time. This is such a hard journey to be on. :( I am covering you in prayer often and trust in Jesus that He is there with you infusing you with His strength.